The Kendo UI Pie Chart widget displays data as single-series sectors from a two-dimensional circle. It is useful for rendering data as a part of the whole. 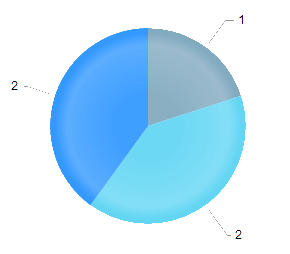 The Kendo UI Donut Chart widget is a Kendo UI Pie Chart variation with the same ability to display a single data series in a two-dimensional circle and is likewise useful for displaying data as a part of the whole. To create a Kendo UI Pie Chart, define a single series of type "pie". Additional series are not supported and each data point is an object that specifies the point value, category label, and other properties, as demonstrated in the example below. 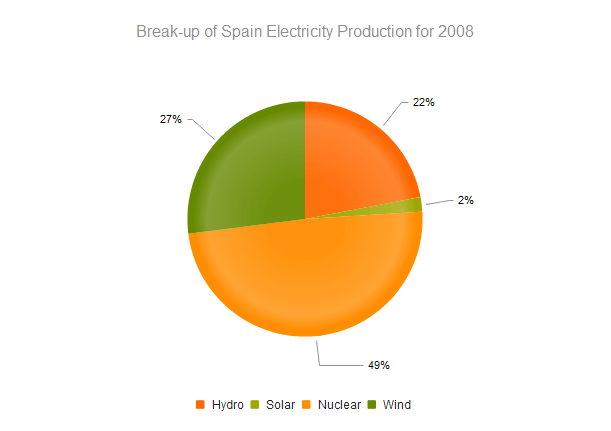 text: "Break-up of Spain Electricity Production for 2008"
Each segment has a transparent effect overlay that adds depth to the two-dimensional shape. The overlay transparent gradient is configurable, as demonstrated below. roundedBevel—This is the default gradient option. The figure below demonstrate the usage of each of these options.